When this installation was first on view, many have questioned what it was intended to mean. 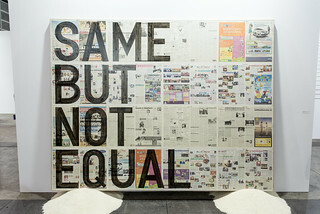 The words “Same but not equal” was painted in all caps on top of a collage of Thai newspaper “khaosod” on linen canvas. The panel was placed on top of two piles of Thai rice. Although the pile of rice appears the same, one pile of rice is ordinary rice and the other, apparently, is premium export-grade Thai jasmine rice. To one art blog Blouin Art Info , it is a commentary about ABHK, where Art Basel Hong Kong, though featuring many of the same galleries seen Art Basel Switzerland and Art Basel Miami, is in many ways different than their counterparts given the type of art works being shown in comparison. To me, it is a commentary on a larger issue where news media speak of the same kind of political news though their analysis and content is highly different. Art is up to all kinds of interpretation. 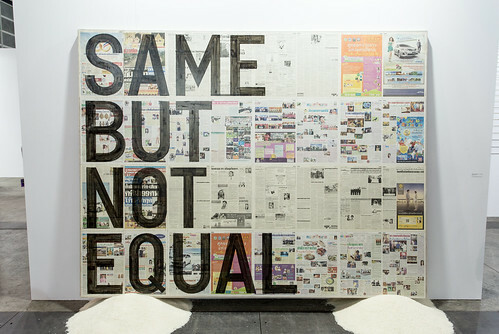 I have no idea if the artist created this piece specifically for ABHK, if so then perhaps that does have some validity. It is interesting nevertheless, though I would most certainly not pay 100-150k USD for it which is apparently the asking price for this work . Rirkrit Tiravanija (Thai: ฤกษ์ฤทธิ์ ตีระวนิช, pronunciation: [rɯk-rit tira-wanit] or Tea-rah-vah-nit) is a contemporary artist residing in New York, Berlin, and Chiang Mai. He was born in Buenos Aires, Argentina in 1961. His installations often take the form of stages or rooms for sharing meals, cooking, reading or playing music; architecture or structures for living and socializing are a core element in his work.